Holy moley! I have some catching up to do! The blogger app on my phone is acting a bit crazy with my pictures uploads which means I have to email myself the pictures, download them, and then attach them. All these extra steps increase the likelihood that I fall behind. Way behind in this case. 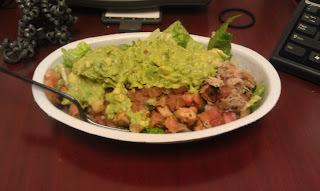 It was Friday so I treated myself to Chipotle! Heavenly! 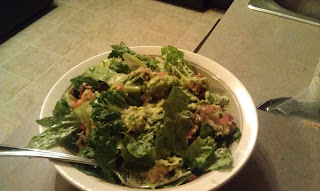 In the salad bowl is salad, mild salsa, carnitas AND chicken and a heaping serving of guac. 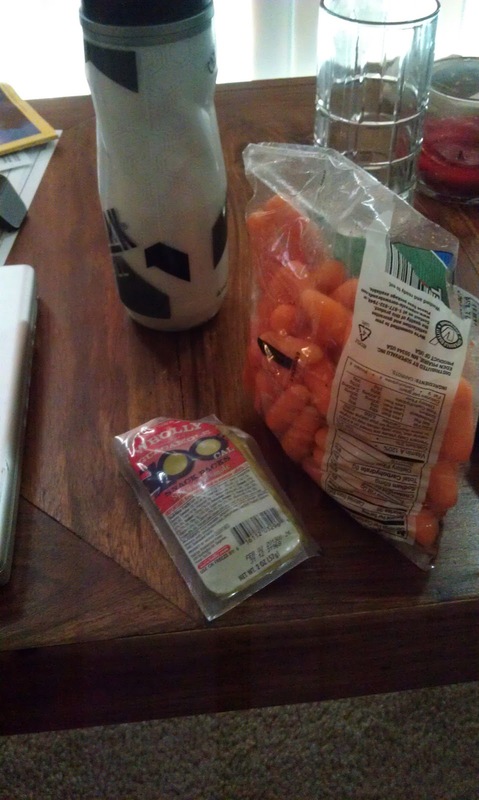 Such a good lunch. Sadly, I did not take a picture of dinner. After a FABULOUS yoga class, my stomach was loud and ready for some food. I went with my yoga buddy to Ted's Montana Grill and had a hamburger topped with avocado and bacon and a sweet potato. 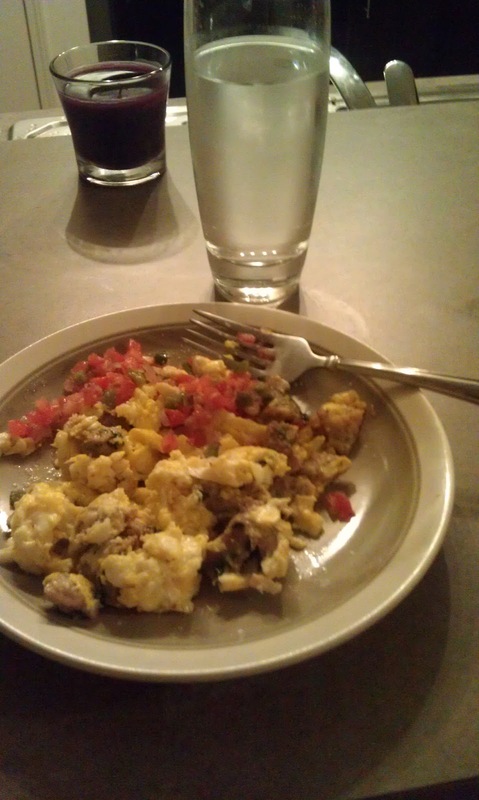 Saturday morning workouts don't happen until 9:30 and I don't like to eat before working out, but I am trying to make an effort to get some sort of calories in before morning workouts, esp. if it is a Crossfit workout. So without fruit, the next best thing is carrots and guac. So here is my pre-workout snack. 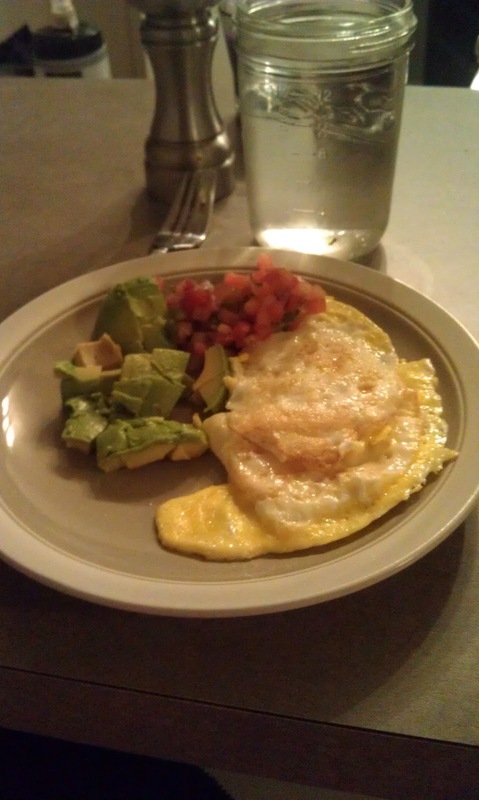 Breakfast after a REALLY hard workout (220 front squats..need I say more). My favorite fuel. 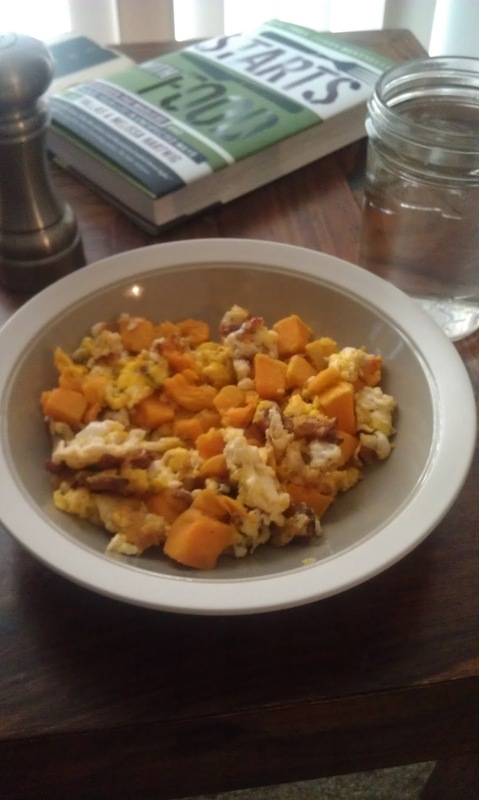 Eggs, bacon and sweet potatoes. Lunch at Nando Peri's. 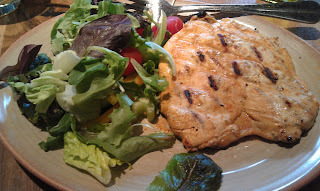 Grilled chicken breast and side salade drizzled with olive oil. Another delicious Chipotle salad. Same combination. Salad, mild salsa, chicken and carnitas, with a side of guac. Warning...you are going to see a lot of repeats today. What can I say? Why mess with perfection?! Breakfast- sweet potatoes, bacon, and eggs. To be more specific, there are two eggs in here, with three strips of bacon, and a small sweet potato. 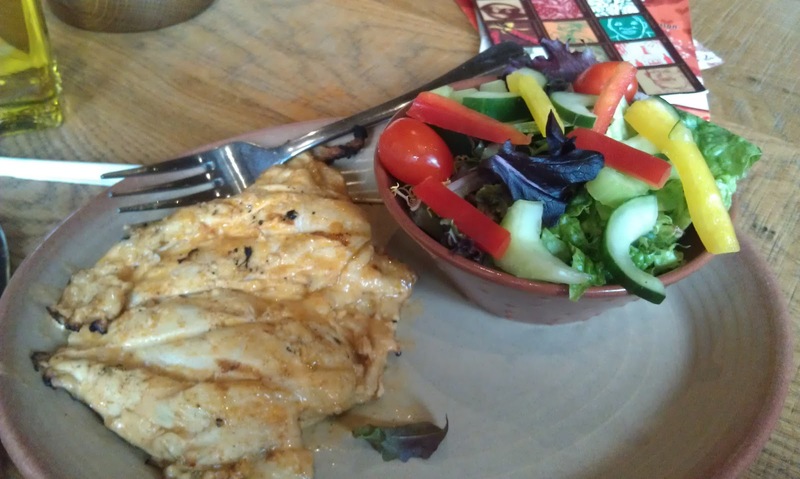 Yup...another trip to Nando's. Grilled chicken breast and side salad with olive oil. 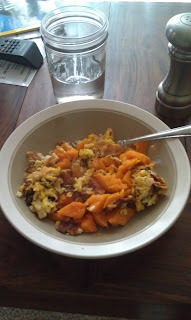 This bowl of goodness was slowly cooking all day and made my apartment smell delicious! 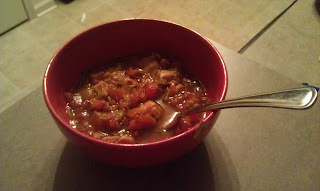 It was a green chile pork stew. I got the recipe here. I made these last night and was super excited to dig into them today. I am not really a fan of devil eggs but I am def. 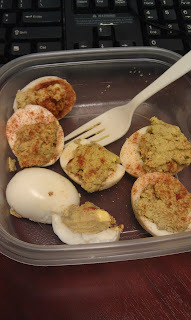 a fan of finding new ways to eat eggs. The filling is made with egg yolk, guac, dijon mustard, and paprika. So when I ate these, I wasn't thrilled but they quickly disappeared. And...my stomach was NOT happy. Needless to say, I do not think I will be eating these again anytime soon. 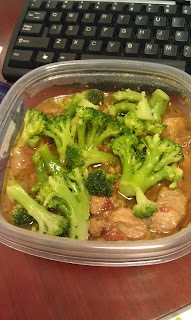 Left over green chile stew with broccoli. 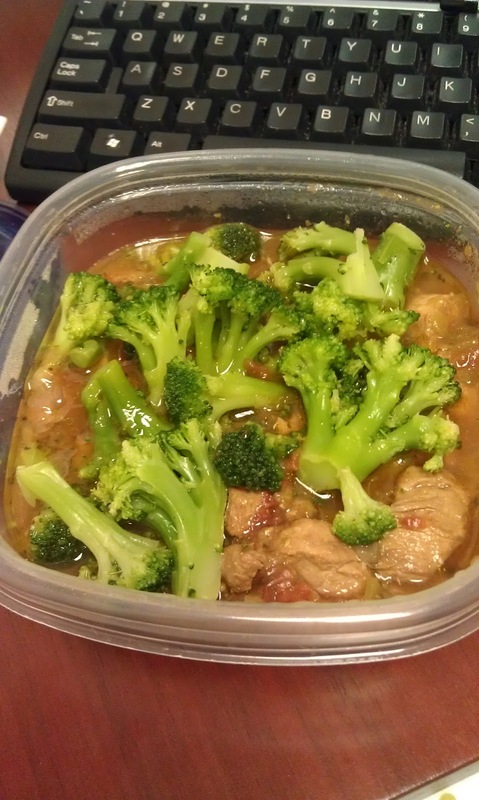 I am trying to sneak in more veggies in all my meals. 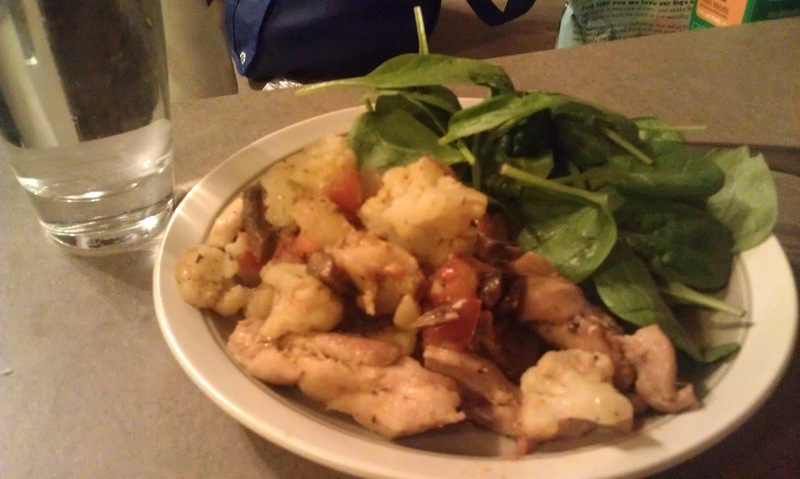 I was craving chicken marsala but of course...no wine...no flour...no butter. So I cooked some dark chicken meat, with tomatoes and mushrooms. I let it cook long and slow so the tomatoes got all soupy and delicious and at the last minute I threw in some garlic and basil and put in some frozen cauliflower. It was not the same thing, but just as delicious. I will certainly make this again. Throwing some hot food on a pile of spinach is another great way to get in more greens! That is my catch-up! Hope I do a better job this week with posting!